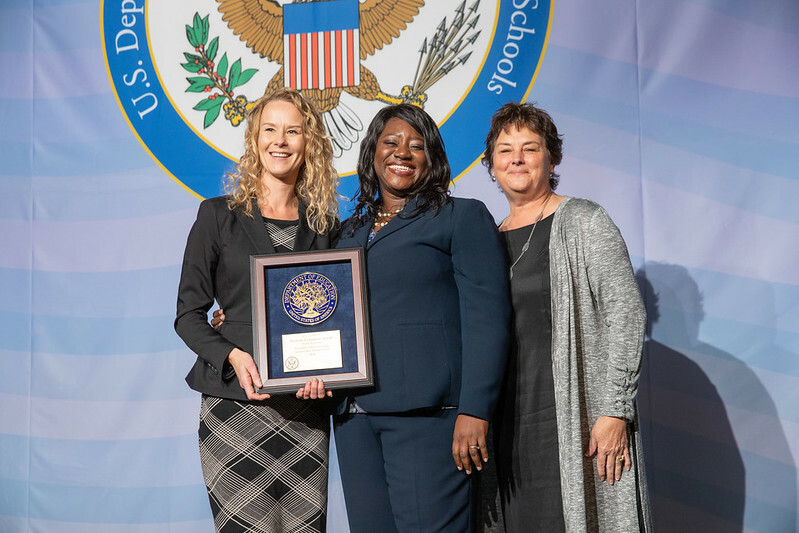 The 2018 Annual National Blue Ribbon School Ceremony on November 7th and 8th in Washington, D.C. brought more than 900 educators together to recognize 349 public and private schools receiving the award. Aba Kumi, Director of the NBRS program, presided over the celebratory ceremony and presented the plaques and flags to schools. Congratulatory remarks were offered by Secretary of Education, Betsy DeVos; and representative from the program’s partners: National Association of Elementary School Principals; Association for Middle Level Education; and National Association of Secondary School Principals. a student representative on the Maine Board of Education, Liberty Ladd, who spoke on the importance of student voice in education. 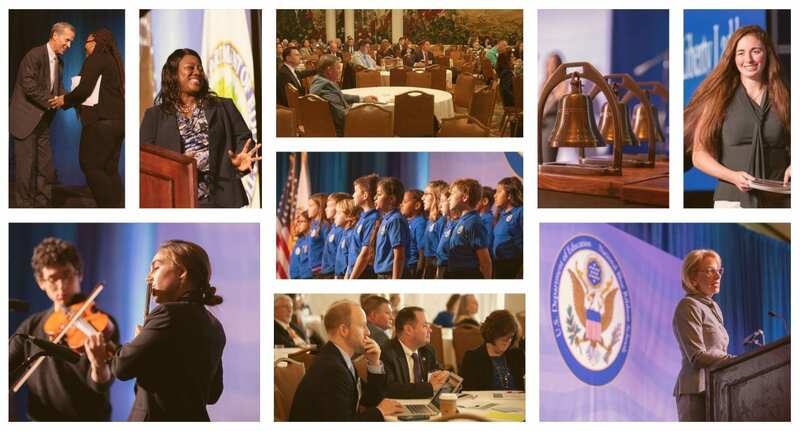 Ten principals received the Terrel H. Bell Awards for Outstanding School Leadership: Demetrios Demopoulos, Archimedean Upper Conservatory (Miami, FL); Margaret Egan, Saints Peter and Paul School (West Chester, PA); Deana Gonzalez, Jackson Elementary School (Rosenberg, TX); Diane Jackson, Tigerville Elementary School (Taylors, SC); Reginald Landeau, Jr., MS 216 George J. Ryan School (Fresh Meadows, NY); Jason Lawson, Lake Hills Elementary School (Spring Lake, MI); Nongongoma Majova-Seane, Stanton College Preparatory School (Jacksonville, FL); Elizabeth Riesenberger, John Foster Dulles Elementary School (Cincinnati, OH); Tracy Speaker-Gerstheimer, Northwest Early College High School (El Paso, TX); and Aisha Thomas, Zach Elementary School (Ft. Collins, CO). One special lifetime achievement award was given to Kathleen Hurstell Riedlinger, CEO, Lusher Charter School (New Orleans, LA). 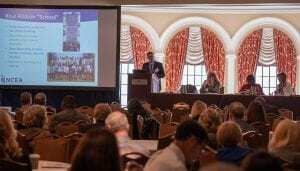 During the two-day meeting, educators had opportunities to share, connect, and hear from an array of speakers, including: a panel presentation from the U.S. Office of Non-Public Education and the Council for American Private Education on a private school’s perspective of the National Blue Ribbon award, a networking café by topic, and roundtable session presenters (see details below). 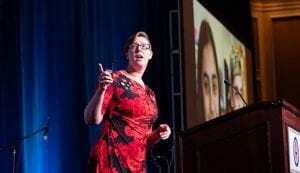 2018 Teacher of the Year Mandy Manning delivered the NBRS keynote address. Ms. Manning teaches English to newly arrived refugee and immigrant students in the Newcomer Center at Joel E. Ferris High School in Spokane, Washington. Ms. Manning shared pictures and stories about two of her students who had multiple needs and what she had to do to meet their needs. She provided examples of how educational policies need to be more flexible to meet the needs of all students. 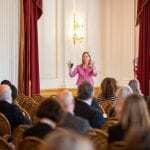 To create more flexible systems, she urged educators to become committed team members who advocate for putting students needs first before system policies and protocols. She encouraged educators to be more directly involved in the creation and implementation of educational policies. 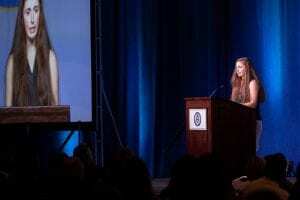 Liberty Ladd, a senior at Falmouth High School and an appointed student representative to the Maine State Board of Education, talked about the importance of educators listening to students’ voices and perspectives and provided examples. She highlighted the impact teachers can have on students and talked about the impact teachers have had on her life. To encourage student voice, Liberty provided descriptions and examples of how schools and educators can elicit student opinions and input. 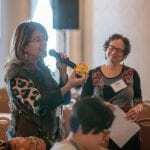 She implored educators to listen to what students have to say and adapt with their constantly evolving needs. Annette Jones, Assistant Director for School Leadership for NCEA and Renee White, Assistant Superintendent for Enrollment and Marketing for Arlington Diocese, were joined by Sherilyn Moses and Victor Pellechia (School Principals).The panel offered helpful ideas for celebrating the NBRS honor-–within the school, with the local community, the state, and international audiences-–as well as shared guides for developing marketing action plans. 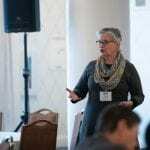 Check out the ideas presented during the presentation: Annette Jones PowerPoint Slides. Dr. Sheila Harrity, Superintendent-Director of Montachusett Regional Vocational Technical School (Fitchburg, MA), described the challenges and obstacles she overcame to take on new leadership roles. Setting the bar high and believing in students will impact student achievement. Provide real world opportunities for students. Stay positive, compassionate, and great things happen. Dr. Harrity’s Power Point can be found here. Cheri Sterman, Crayola Director of Education led participants through hands-on creative activities. Ms. Sterman stressed the importance of creativity in developing students’ future workforce-ready mindsets and abilities. Ms. Sterman provided participants an opportunity to plan how a Creative Leadership Team can build school-wide creative capacity, support colleagues, and drive change in schools. Developing a Creative Leadership Team (e.g., I love the idea, we will incorporate CLT into our school improvement committee, excited to start a team, that it takes effort to make it happen). Creative thinking is an essential skill for all students to learn. Creativity comes in many forms and can be incorporated into all areas. Creativity transcends all ages, learning types, genders, etc. – anyone can do it! Creativity takes effort, time, and dedication with a goal in mind. Hadley Ferguson, Executive Director, and Cindy Leatherwood, Outreach Manager of the Edcamp Foundation provided an overview of the Edcamp’s key tenets and its approach. The Edcamp model engages educators, empowers teacher voice and choice, and energizes learning communities. Participants had opportunities to experience the Edcamp approach during the session. Many participants liked the flexible approach to adult learning that leads to connections/networking and camaraderie with other educators. Other participants reported that they could see the approach being successful at the classroom, staff, and district levels as well as successfully increase teacher buy-in. You can find Edcamp’s Power Point here.